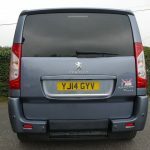 This Exclusiv model of the Peugeot Expert really does provide an excellent driving experience. 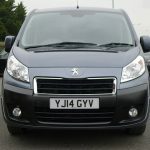 With a 2 litre diesel engine and manual gearbox the new owner of this smart wheelchair accessible vehicle will be able to enjoy the performance this vehicle produces whilst taking advantage of all the added features included – blackout windows, power fold mirrors and parking sensors to name a few (please check out the specification section for a full list). 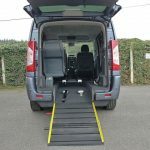 An O & H Mobility conversion and adapted to a high standard. 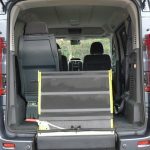 The lowered floor in the back has a very long floor length of 190 cms – so plenty of room to carry any additional or necessary equipment in the back for the wheelchair user. 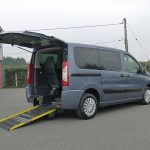 Four people can travel around comfortably in this WAV plus the wheelchair user. 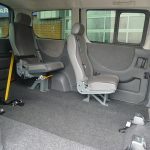 You will see from the photographs above that the two back seats sit one behind the other and the very back seat has been adapted so that it can be folded and moved out of the way should it not be required, or on the other hand to provide even more space. 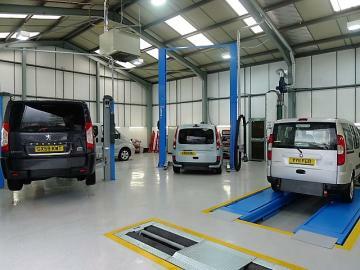 For added luxury the wheelchair location has been carpeted. 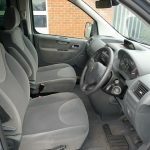 Air conditioning is included so all occupants of this wheelchair accessible vehicle can enjoy keeping cool on those warmer days and longer journeys. 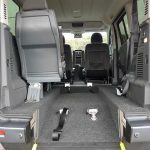 Many other extras include arm rests and seats that are height adjustable in the front, an overhead storage area to keep the vehicle nice and tidy plus some handy drink holders should they be needed. 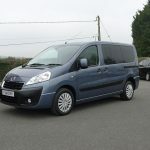 If you wish to know more about this lovely medium sized vehicle, please give us a ring on 01824 707773. 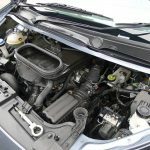 Our experts are always on hand to answer any questions you may have and provide guidance on which vehicle would be most suitable for your particular needs. 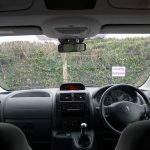 But please check out our ‘Advice’ section above – it really is very useful and has a wealth of information to help you through.